← Beauty heals my soul! Are we swallowed up by our fears or by walking through them do we become free to say what we need to say? In the mouth of the monster. . . . Creative duality. Opposites opening up options. Beauty and terror, light and darkness, opening and closing. Do our fears swallow us or do we use our inner strength to find a way to say what needs to be said? 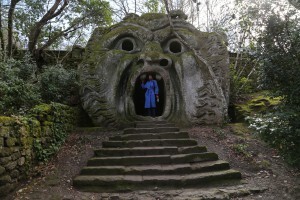 Here at Bomarzo ‘Park of Monsters’, this special dining room was shaped with eyes for windows and the month is the door. It feels like it will swallow you up as you climb the steps. But face your fears, enter the hidden room, and the acoustics create the opportunity to magnify what needs to be said. Our May 2016 retreats are almost one third full. If you want a chance to visit this incredible garden and find what art comes from finding your voice, check out the website for special early bird pricing before Labor Day. TheQuietGarden.com or send me an email from the form at the bottom of the website page.